If you want to wow non-veggie relatives, Farmacy is the place. THE BURGER: The Vurger has taken up residence a whisper away from Mooshies Vegan Burger Bar on Brick Lane but holds it own, with melty burgers that can, literally, drip down your arm with tasty lushness. We recommend the MLT: roasted shrooms, borlotti bean and parsley patty with tomato, rocket, ketchup cheese and hundred tomato and walnut paste. Feed your soul indeed. Richmix Square, Shoreditch E1. THE ITALIAN: Fed By Water is a modern, full vegan Italian restaurant specialising in clean eating - which includes the water. Only purified water is used during the cooking process, eliminating impurities and retaining nutrients and flavour. In the meantime, the cashew nut cheese is a revelation, says The Financial Times. 64 Kingsland High St, Dalston, E8 2LX. THE CHIPPY: In the early rush to create perfect vegan junk food, fish and chips were left out of the mix. Sutton and Sons provide just that. The Hackney branch is reincarnated into a vegan eaterie with extremely convincing fish and chips, scampi - and prawn cocktails. 218 Graham Road, Hackney, E8 1BP. 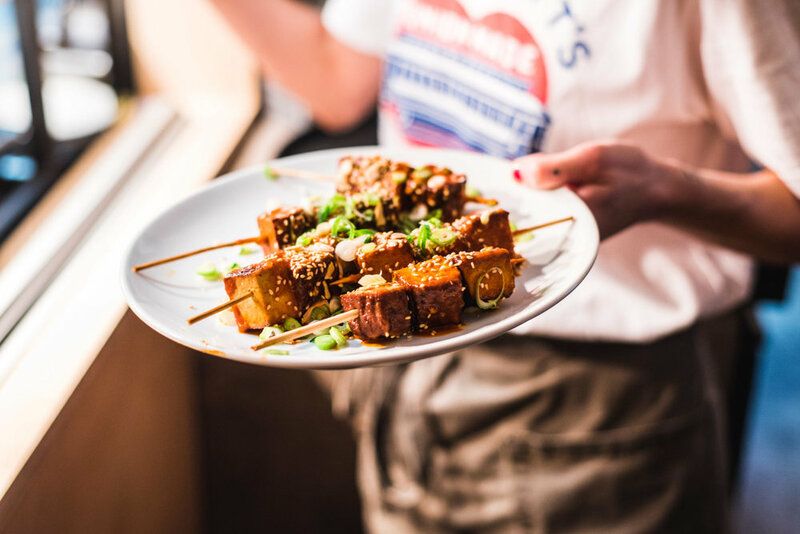 THE HIP HANGOUT: Shoreditch hosts the latest vegan kid on the block, Genesis, brainchild of the Santoro brothers, whose family has spent the last century in butchery. With its religious-laden, ‘zine graphics, vegan cocktails and zesty international menu, the self monikered “100 per cent plant based alchemy restaurant concept specialising in fast casual dining and organic comfort food” is another step in taking vegan dining mainstream. Very, very much a fan. 144 Commercial Street, Shoreditch E1. THE OLD GUARD: MIldreds has been around for 30 years, offering its plant-based fare to its loyal following of non-meat - and meat - eaters. Back in the day, eating at Mildreds felt virtuous and alternative. It’s not all vegan but with that kind of history in making plant-based food yummy, it deserves its place here. Food is cooked daily at its four premises and organic ingredients used whenever possible. Still a flagship for kind eating. 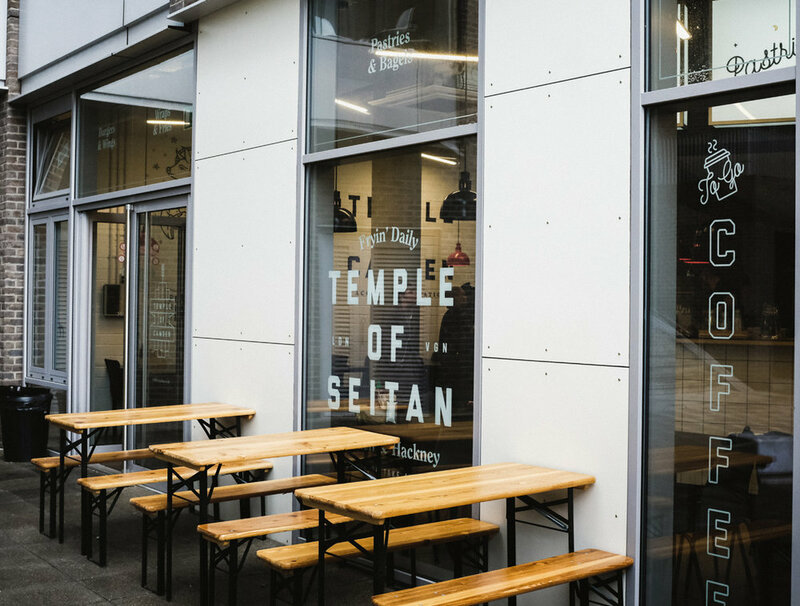 THE FAST FOOD JOINT: Hackney’s Temple of Seitan always has a queue in front of it and for good reason: this is hearty fare including, yes, burgers, but also the animal-lovers’ reply to all those cheap, badly killed chicken shops littering high streets. We recommend the chicken ‘Twist Wrap’ and the ‘Wings Original’. We love the new(ish) site at Camley Street, handily close to the Natural Park for a double whammy of nature love. THE CELEBRITY HANGOUT: No better way to get the message out there than to glean celebrity support - and no better place to do that for veganism than at Farmacy, glossy brainchild of Camilla Al-Fayed, scion of Harrods. If you want to wow non-veggie relatives, this is the place, with its central island bar, natural - but polished - materials and heaps of foliage - and scrumptious food, sans dairy, sans sugars, sans additives. Westbourne Grove, W2. THE FAMILY DINER: “Describing itself simply as a ‘vegetarian and vegan canteen’, Wildflower an open, stylish spot that does recall a canteen (albeit one attached to a graphic design office). But while the room is fairly straightforward, the food is something quite special,” says Time Out. Read the full review here: timeout.com Level 5, Peckham Levels, 95a Rye Ln, SE15 4ST. THE CHAIN: The USA’s most hyped vegan chain By Chloe opens first in Covent Garden and now in Tower Bridge, serving lush vegan fast food, including the famous Guac Burger, fish and chips, and shepherds pie in super bright, poppy environments.